Missouri’s candidates for U.S. Senate have shared a stage for the first time, only days removed from a primary election that pitted them against one another. 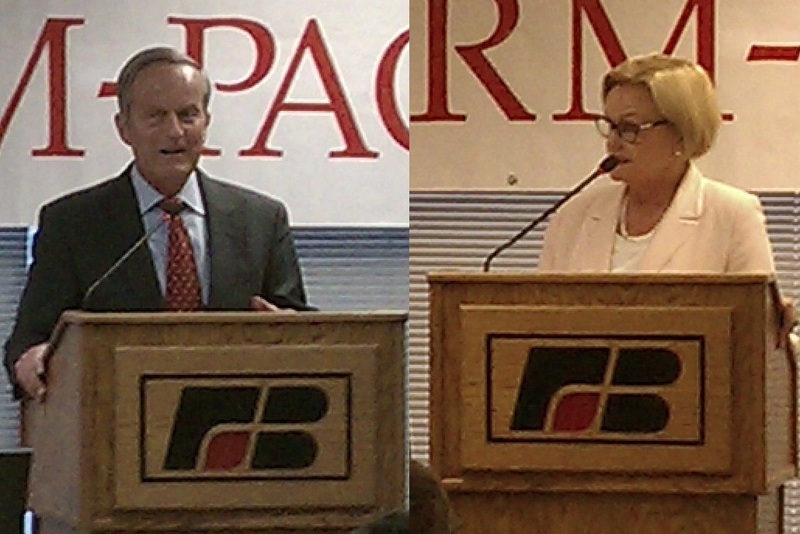 The candidates fielded questions from more than 200 farmers with Missouri Farm Bureau’s Political Action Committee. 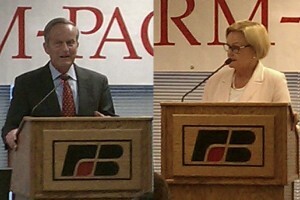 Congressman Todd Akin and Senator Claire McCaskill speak to Missouri Farm Bureau. McCaskill says the farm programs and entitlement programs are tied together so that urban legislators who aren’t concerned with farm issues will vote for the whole package. Akin beat out former state treasurer Sarah Steelman and St. Louis businessman John Brunner for the Republican nomination for U.S. Senate in Tuesday’s Primary. 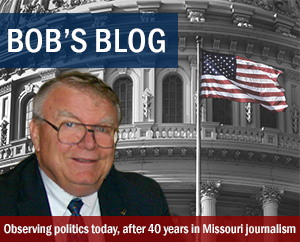 McCaskill ran unopposed on the Democrat side. He said less than a week ago that he didn’t trust polls that said he was trailing in the GOP primary race for U.S. Senate. On election night, Congressman Todd Akin’s mistrust proved right. Akin received more than 217-thousand votes, to more than 180-thousand for businessman John Brunner and 176-thousand for former treasurer Sarah Steelman. 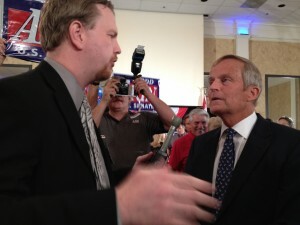 Winner of the GOP Primary race for U.S. Senate Todd Akin (right) answers questions from Missourinet’s Mike Lear. A strong showing in 2010 gives Republicans confidence about winning the big prize in 2012, but they have to get out of their own way first. Senator McCaskill says Missouri Democrats must do a better job of getting their message out and she hopes their new leader helps in that effort. McCaskill denies she worked behind-the-scenes to maneuver former State Representative Craig Hosmer of Springfield out as chairman of the State Democratic Party and soon-to-be former state Auditor Susan Montee of St. Joseph in. President Obama’s top economic adviser has announced he will step down to mixed reaction by Missouri’s senators. Senator McCaskill, a Democrat, sees no signs of a big shake-up with the decision of Lawrence Summers to step down as National Economic Council director in November to return to Harvard. She does see opportunity. Three of the president’s top four economic advisers have decided to leave the White House. 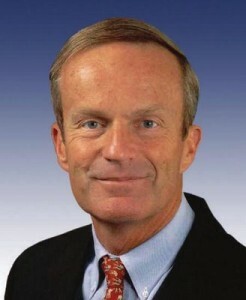 Summers served as Treasury secretary in the Clinton Administration. McCaskill points out that Summers initially agreed to join the Obama Administration for only one year to help the country dig out of the recession. He has stayed two, primarily to guide passage of an overhaul of the financial regulatory structure. Treasury Secretary Timothy Geithner is the last remaining economic adviser to arrive with Obama when he began his presidency in January of 2009. Budget director Peter Orszag left in July. Council of Economic Advisers chairwoman, Christina Romer, left earlier this month. 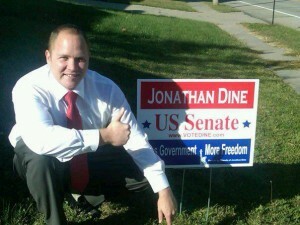 Senator Bond, a Republican, is glad to see Summers go. Bond hopes that President Obama seeks someone from the private sector to replace Summers. “We don’t have anybody around the president who understands how the private sector works,” says Bond. 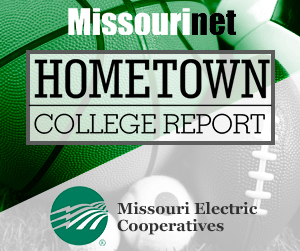 While disagreeing on the performance of Summers, Bond and McCaskill do agree that any new economic measures must concentrate on spurring the growth of small businesses. Congress has taken a step in that direction. It has passed the president’s small business incentive program, which provides easier credit and $12 billion in tax cuts for small businesses. The bill also creates a $30 billion fund to help small banks left out by the 2008 financial rescue package. 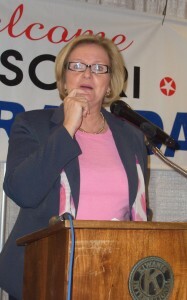 Senator McCaskill told Democrats gathered for Hannibal Days that Congress and the White House is doing the hard stuff as Republicans resort to obstruction as a political strategy for 2010.